The cooperation of national enterprise agricultural cooperatives in Southern Bohemia led to Bohemia Chips’ launch in 1982. The aim was to better commercially exploit the potential of South Bohemia fertile fields, but it was actually a bit of a gamble because up to that time, importing Chips to the country was illegal. Potato Chips were therefore not a readily identifiable consumer product in Czechoslovakia at that time, but the Western style Potato Chips proved an instant hit. They were sold with the fruit and vegetables. The factory in Choustnik now handles up to 60,000 tons of potatoes per year. There are four ranges of Chips produced: Bohemia Chips, Grande, Senza, and Traditional Czech Potato Chips. There are no less than 26 varieties of shapes and flavours. Bohemia is the Czech Republic’s best-selling brand. 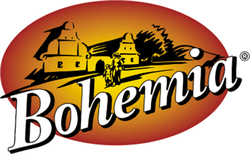 Bohemia has operated under the Intersnack umbrella since the mid 1990s. The headquarters are in Dusseldorf. Intersnack is a leading manufacturer of Potato Chips throughout Europe. It has 16 subsidiaries, 26 factories and 6,000 employees. The organisation’s products are sold in more than 70 countries.